By joining the email list you'll get instant access to our resource library of printables. Get inspiration and encouragement to connect your family to nature. I'll send you tips, activity ideas, printables, news, relevant promotions, and goodies sent right to your inbox every week. Join the Club and start the fun now! Thank you for signing up. An email will be arriving in your inbox shortly. Skip the hassle of visiting the resource library and download them all in one package instantly! Forget the hassle of downloading all these printables separately from the Resource Library and instead just grab them all here in one instantly downloadable package. Getting your family outside this summer will be easier with these activity calendars giving you weekly ideas and activities. You'll also have some scavenger hunts and outdoor games to pull out when your family needs a little more motivation to hit the parks, sidewalks, and trails. The calendars for September, October, and November are made for the 2018 calendar year. These calendars are filled with outdoor adventure and play ideas. Each weekend is family adventure time to remind you to get out as an entire family every week! Every month comes with new and different suggestions. The scavenger hunts are great for families and groups with varying ages as some items to find are more challenging than others. Some hunts can be completed in an hour, others may take more than one outing to fully complete. The intention of these hunts is to get your family outdoors, exploring, watching, and playing. 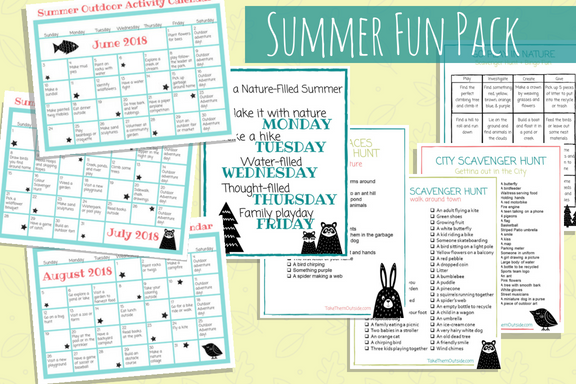 The Go Play in Nature Bingo is meant to be used as an activity suggestion tool. It is not meant to be completed in a day. Instead, try completing the activities over the course of a week or the entire summer.